Can you handle the fun and excitement that Big Bang has to offer? Click here to play! This classic 3 reel game offers players plenty of modern fun with a traditional feel. Plus, if you can spin the reels just right, you'll find yourself bringing in plenty of big money wins. The ultimate symbol in this three-line game is the Big Bang coin. This golden money piece will pay out up to 6000 credits if you can spin three of them across line three. If you can spin three across line two, you'll get 3000 credits. And three across line one will get you 1000 credits! That's not all; this game also offers lucky sevens. Spin three of these red number sevens across one of the pay lines and you'll get up to 200 credits. There are also triple, double and single BARS, which will get you 20, 25 or 10 credits respectively. Don't forget the cherries. You can't have a 3 reel game without cherries. Spin three of these across an active pay line and get up to 5 credits. So, jump right into this fabulous game and see if you can handle the Big Bang. If you've got the right touch, you'll definitely be leaving your slots session with plenty o' cash! 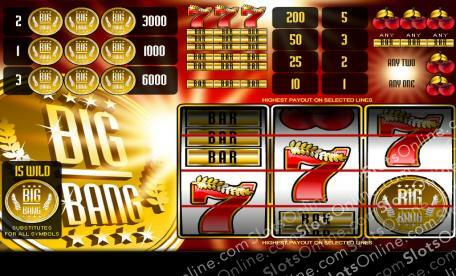 The golden Big Bang coin acts as a wild and will substitute for all other symbols to help you bring in more wins.